Looking for a healthy and nutritious breakfast or treat to fuel you up in the afternoon? Make this delicious gluten-free Fruit Freakshake – Packed with fresh fruit and no added sugar! This Fruit Freakshake is the perfect treat to enjoy on a hot day. I love making it during the weekend, as I have more time to dress it up with all the fruit on top. BUT, if you don’t fancy all the yummy décor, this gluten-free Fruit Freakshake takes just 5 minutes to make, making it a perfect breakfast-on-the-go on busy mornings. 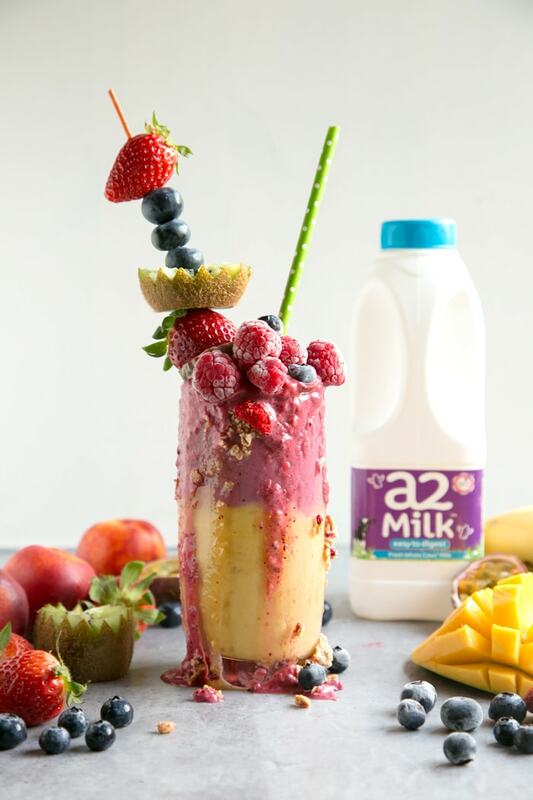 This is definitely not an ordinary milkshake though, is loaded with fresh fruits, highly nutritious thanks to the fresh whole a2 Milk™ added in, and healthier than the average milkshake thanks to my secret nice cream trick. We’ve been hooked to nice cream since I first made it years ago. 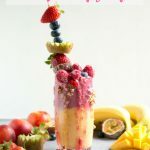 We eat it regularly, so it was no brainer for me to use it in place of regular ice-cream in this awesome Fruit Freakshake! If you have never heard of nice cream, is a magic ice-cream made with frozen chopped banana blended up into soft serve. It takes literally 3 minutes to make and you’ve got the most delicious and healthy ice cream ever. 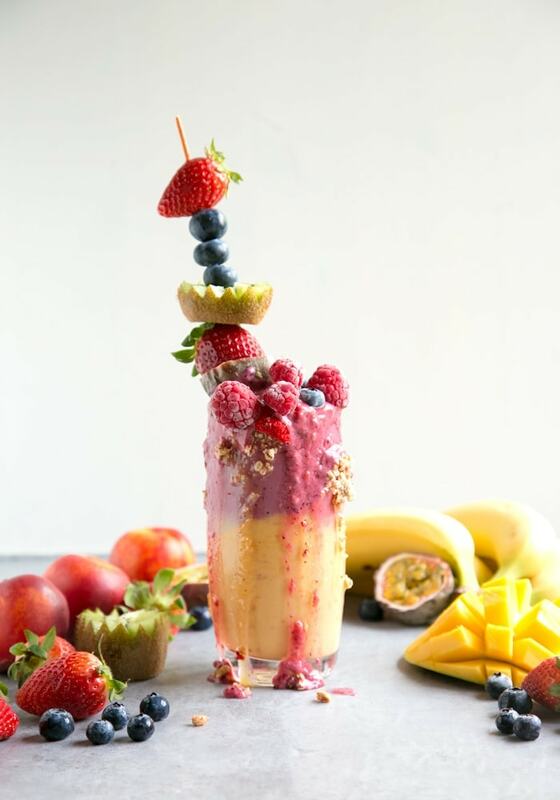 To make this Fruit Freakshake, I’ve used frozen banana as a base, then added mango and milk for the lower layer, and fresh and frozen berries for the top one. The best part is that you don’t need to add any extra sugar, as the banana sweeten things up naturally. This nutrient-packed Fruit Freakshake is easy to customize with your favorite fruit. I love the sweetness of the mango contrasting the tart flavour of fresh berries. But feel free to experiment with any other fruit that will give a similar contrast of flavour. The milk I used for making this delicious freakshake is the long-time favourite a2 Milk™. This award-winning brand produces milk naturally free from the A1 milk protein, which may cause health issues to people who are dairy intolerant. 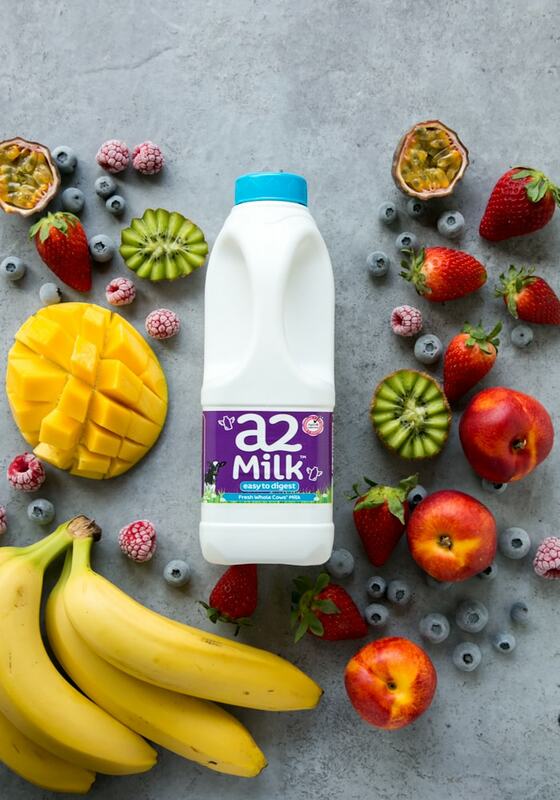 I’ve been dairy intolerant for years, but since discovering a2 Milk™ I was able to re-introduce milk in my life, without all the discomfort I used to have, so I highly recommend it! Since World Milk Day is just around the corner, why don’t celebrate the benefits of drinking milk with this smoothilicious Fruit Freakshake? Looking for a delicious and nutritious breakfast or a healthy treat to fuel you up in the afternoon? 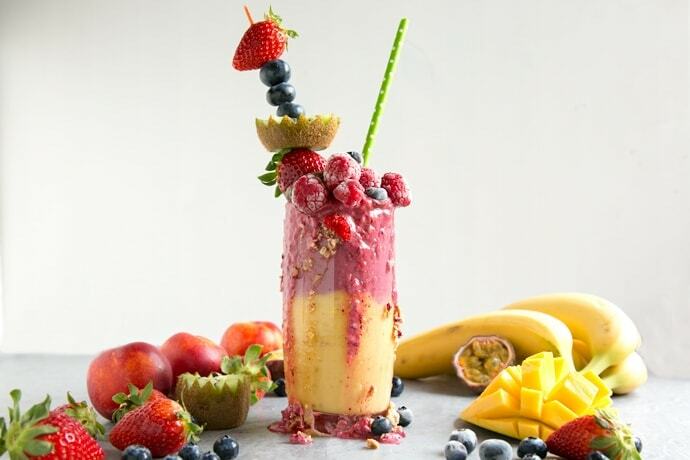 Make this delicious gluten-free Fruit Freakshake – Packed with fresh fruit and no added sugar! Add bananas to the food processor (or high-powerful blender) and blend. Scrape down the sides every now and then and continue to blend until smooth, approximately 3 minutes. Remove half the nice cream and set aside, then fold chopped mango and half the milk into the food processor, and blend until creamy. Divide the mango shake between two glasses and set aside in the freezer for 2 minutes. Fold the remaining ice cream back in the food processor, then add fresh & frozen berries and milk, and blend until creamy. Divide the berry shake between the two glasses and serve immediately. For the toppings & decoration: Rim the glasses with a little honey and spread crumbled granola all over (optional). Thread any of your favorite fruit onto two skewers, and arrange into the serving glasses. Top each fruit freakshake with extra frozen berries and serve. As a huge lover of nice cream, your eye catching freak shake recipe comes handy to take my simple 1-ingredient banana ice-cream to the next level. Oh, my gosh! I literally drooled when I saw your fruit freak-shake! It looks refreshing, beautiful and delicious! That shake looks almost too beautiful to drink, but I’m going to drink it anyways! Delicious recipe! What a gorgeous treat for a hot day! Your photos are fantastic! It is great to see a freakshare recipe that isn’t filled with candy and chocolate! This fruity freakshake looks amazing! looks delicious , thanks for sharing such wonderful recipe .